Nick really wanted to do the trike ride Eastern Sydney again. He did it last year and had to save up again. Nick has cerebral palsy and the trike is perfect for him. He can sit in the middle with a seatbelt on and the back of the drivers seat keeps him in. His carer Tessa went with him and they had a ball. As you can see by the photo, there are grins from ear to ear. Craig picked them up from near Jeffrey Street Wharf, drove them over the Sydney Harbour Bridge, around the Royal Botanical Gardens and past Mrs Macquarie’s Chair. Next they drove through Woollomooloo and the infamous Kings Cross. They headed out through the eastern suburbs to Bondi Beach, probably the most famous beach in Australia. After exploring the area they drove back through the city and over the bridge to Kirribilli to their van. A trike ride Eastern Sydney is a wonderful way to see famous parts of Sydney. You will see all the famous sights such as the Sydney Harbour Bridge, the Sydney Opera House, Bondi Beach, The Royal Botanical Gardens, Mrs Macquarie’s Chair and much more. Thank you for sending these through, they’re lovely. Yes, our ride with Craig went well! We both loved it and enjoyed our time. Anthony was very surprised with the gift! 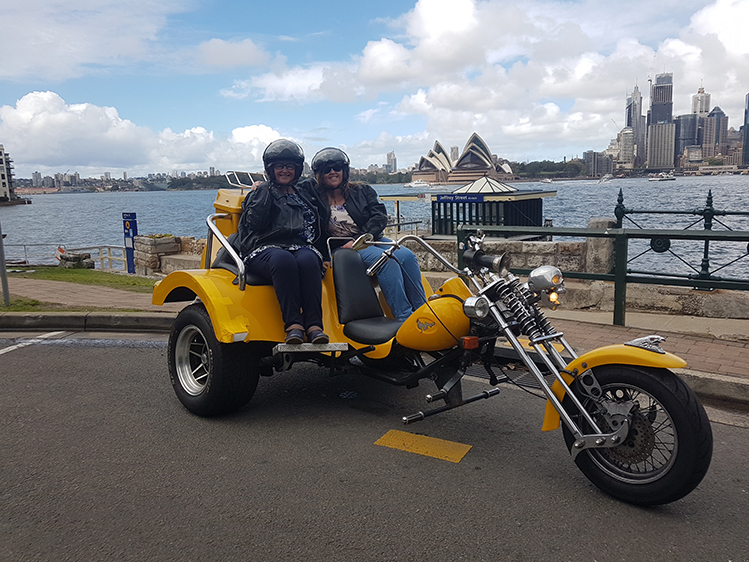 Visiting Sydney, Sandy thought it would be a great idea to organise a surprise trike tour gift. Anthony got a huge surprise and loved every second of it. Just wanted to let you know that the group had the most awesome time on Monday. We look forward to doing this again in the future. The adults with disabilities trike ride is fun for all. 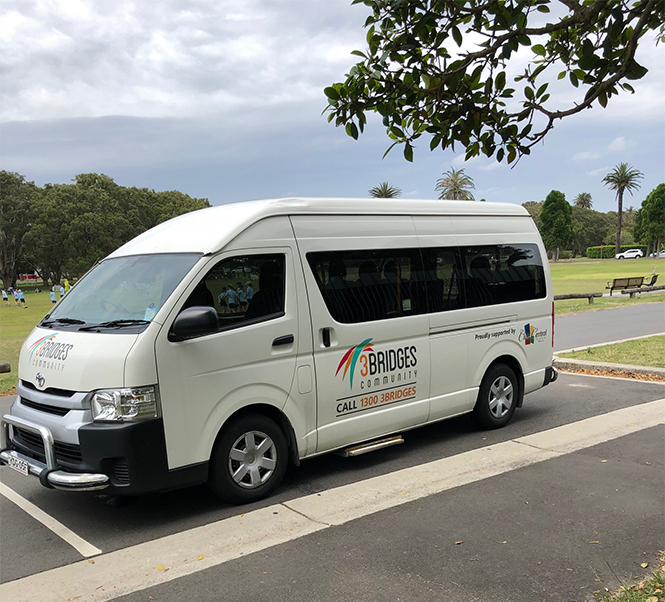 A few times a year 3Bridges Community organises the rides with us. The passengers and the staff all love the trike ride so much. Brian meets them at Centennial Park and takes a few at a time on a ride around the park. Because of privacy we won’t show the adults with disabilities trike ride photos. If you have a group of children or adults with disabilities a trike ride is a great way to give them a safe and fun experience. The trikes all have seatbelts. We had an AWESOME time! Craig was the best. We enjoyed every minute and will gladly share the pics (I asked the girls) and a glowing review once we get home. 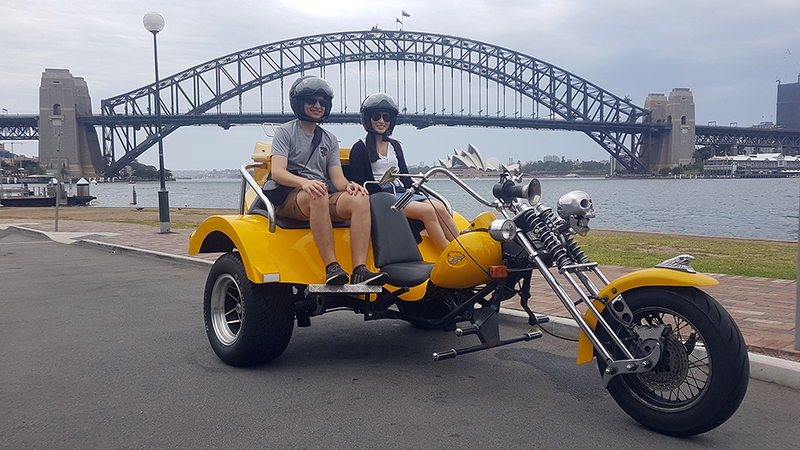 A trike tour Manly Sydney was what our 3 Canadian passengers wanted to do. 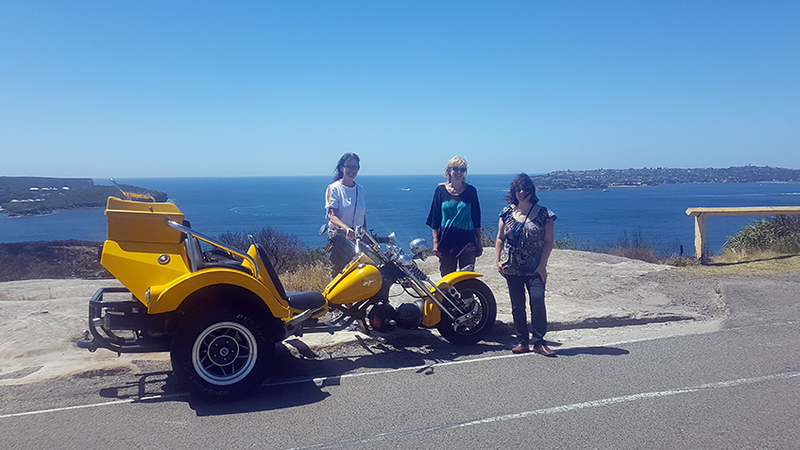 Craig our trike rider, picked them up from Novotel Hotel Manly and toured the Northern beaches. They then returned to Manly via Narrabeen Lake and Dobroyd Headland. Our passengers saw some of the loveliest views in Sydney on this tour and some of Sydney’s best beaches. Craig was enjoying himself so much that he gave them extra time. It was such a beautiful day for a ride, Sydney certainly showed itself off! The Northern Beaches is an area in the northern coastal suburbs of Sydney, in the state of New South Wales, Australia, near the Pacific coast. This area extends south to the entrance of Port Jackson (Sydney Harbour), west to Middle Harbour and north to the entrance of Broken Bay. The tour was amazing and Perry was great! Of course I’ll write a review that’s no problem at all. And yes you can use the photo. A Harley ride Christmas Voucher present was such a great idea. Holly’s parents didn’t know what to buy her for Christmas last year so they bought her the Harley ride. Buying the voucher meant she could pick a date that suited her. Perry picked her up in the Eastern suburbs, drove her around the city, over the Harbour Bridge to the north side where they did the Kirribilli Loop. This involves stopping near Jeffrey Street Wharf for photos and a view across the harbour to the Opera Hause and Sydney city. It also has a view of the Harbour Bridge from the side and you’ll also drive underneath it. They rode back over the Harbour Bridge, around the Botanical Gardens, past Mrs Macquarie’s Chair and back to the drop off in Bondi. Holly and Perry both had fun on the ride, the riders love showing off Sydney from the back of their Harleys. If filling out the Gift Voucher form online is too difficult, just email or ring us with what you would like. We will get in touch to arrange it with you. The ride with Craig was great. We had a fantastic time. Happy for you to use photos. Hoping you had an enjoyable weekend. Thanks ever so much for forwarding the photos. Feel free to use any on social media. Mum (Gail) & I had a wonderful time. Even though we are Sydney locals, it was so great to see the sights of Sydney from such a different perspective. Many thanks to Craig our driver- he was awesome. Sharing his knowledge of Sydney and navigating around the Sydney traffic. We both thoroughly enjoyed the experience. Karen organised a 3 Bridges trike tour for 70th birthday of her mum Gail. There are actually about 6 bridges on the tour but the 3 main bridges of Sydney are on this route so we call it the 3 Bridges Tour. The main ones are the Sydney Harbour Bridge, the Gladesville Bridge and the ANZAC Bridge. When Craig drove the passengers over the Sydney Harbour Bridge he did the Kirribilli Loop and Blues Point. He stopped at both places to take some photos and continued on the route. It was touch and go to start with but the weather held off. They kept dry while they saw the lovely views of Sydney from different angles. 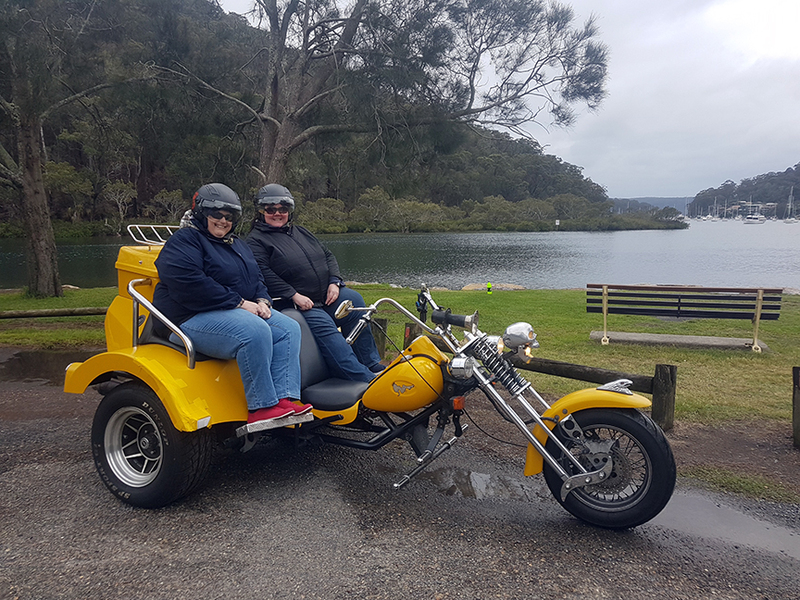 A 3 Bridges trike tour for 70th birthday (or any birthday) is a great way to celebrate! Fantastic time again thank you, Katrina! You, personally, were great and really easy to deal with and totally got us sorted. And the guys were all fab too. My younger daughter and my sister and her girls all had a great time! Please feel free to post any photos on social media. I’ll try and drag my husband over to Sydney as I’d love to do the 3 hour out of town with him. Here’s hoping. 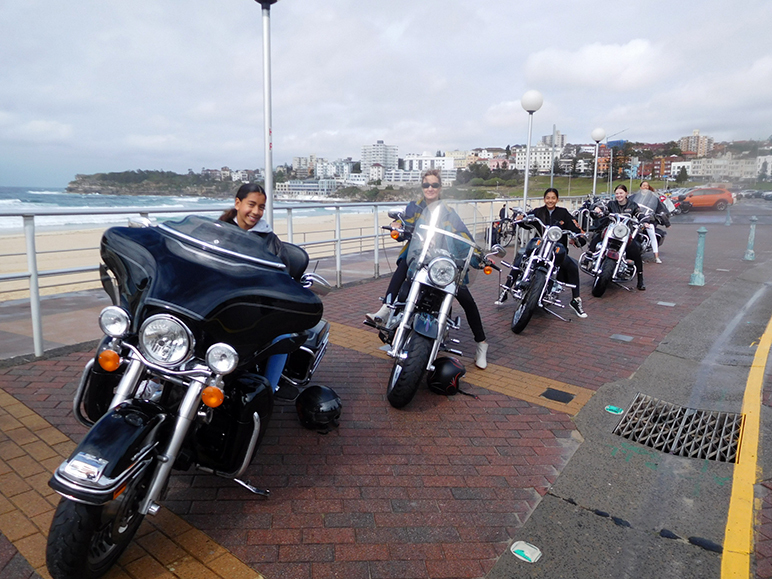 A Harley ride Bondi Beach Sydney is just what Angela ordered. She did a ride with us last year while in Sydney on holidays with her daughter. This time she was is Sydney on holidays with her other daughter, her sister and her nieces. 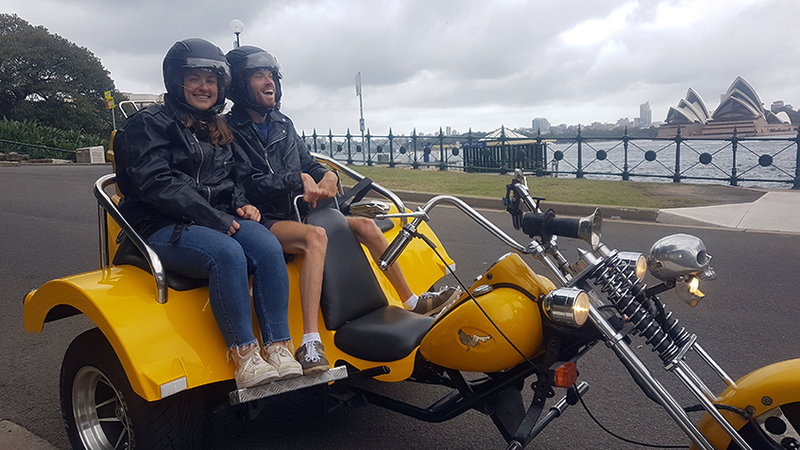 Our Harley riders picked them up from their hotel and rode through Paddington, Bronte, Tamarama, Bondi beach, towards Watsons Bay, Rose Bay, Double Bay, Rushcutters Bay, Kings Cross, Woolloomooloo and back to Hotel. The weather held off mostly and the passengers all had a such a fun time. Angela is now thinking of booking a longer ride for herself and her husband. We love it when our passengers have such a great time that they want to do another ride. 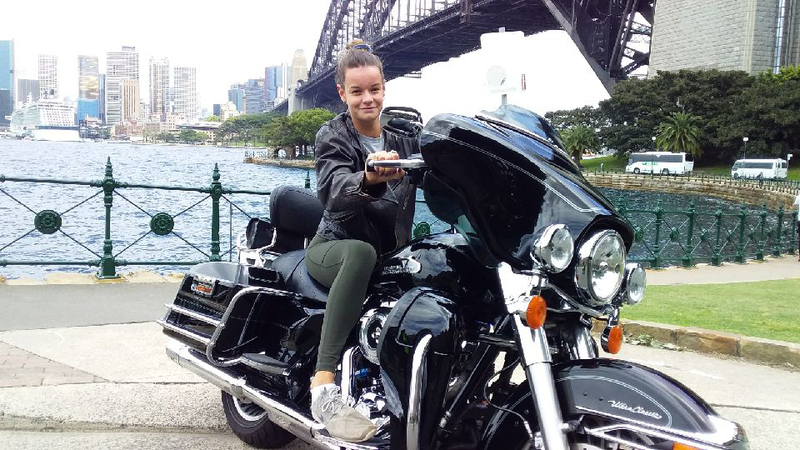 A Harley ride Bondi Beach Sydney or actually anywhere in Sydney or the outer areas of Sydney is fun to ride around.